Teijin Limited announced today that its automotive composites specialty groups have developed a multi-material composite automotive door concept that maintains required crash specifications while reducing overall weight by 35% when compared to a conventional steel door. A prototype of this unique approach, developed jointly by Teijin Composites Innovation Center (TCIC) and Continental Structural Plastics Holdings Corporation Opening a new window (CSP), will be on display in the Teijin Group booth (hall6, G28 & J28) at JEC World 2019, taking place March 12 to 14 in Paris. The module is made from carbon fiber sheet molded compound (SMC), glass fiber SMC and unidirectional glass fiber reinforced plastics (GFRP) to offer both high strength and low weight. Additional benefits include cost efficiency equal to that of an aluminum door module, and the ability to achieve deep draws and superior design freedom not achievable with a metal. 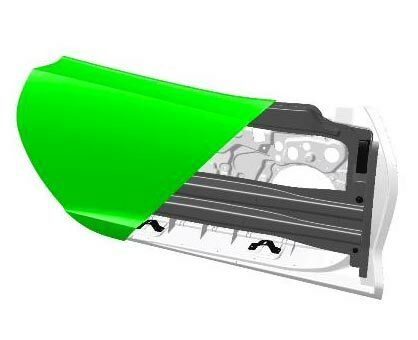 The solution also withstands the heat level of the conventional E-coat automotive painting process. Teijin plans to continue enhancing the quality of its side-door module capabilities by applying various high-performance materials and technologies available within the Teijin Group. Leveraging its strengths in composite technologies, the goal is to launch a commercial door module by 2025 and become known as a global supplier of multi-material automotive components, targeting sales worth approximately $2 billion by 2030.